Followed by a laugh, because I had def never heard of said hashtag until a few weeks ago, but man do I love it!!!! lol Serve me anything on a warm slice of sourdough and you and I will have a special bond for life. Add a mimosa to the mix and you’ve found yourself a new ride or die. (Read: don’t show up on my doorstep with bubbles and fresh bread if you aren’t looking for a new bestie.) I digress. Moving on to the food trend that you didn’t know you straight up didn’t know you needed- HUMMUS TOAST. I mean if you are up on your food trends, you might have already known that, but I personally generally fall into the ‘12 or so months behind’ category when it comes to anything ‘trendy,’ soooo I’m generally “Oh, wow, this is different but yummy..’ around the same time that your average Angelino is all “Omg if I see another cabbage enchilada I’m going to scream.” I’ve still yet to experience one, for the record. Anywho- when my peeps at Sabra Hummus filled me in on the fact that Hummus Toast is giving Avocado Toast a run for its’ money, I was floored on so many levels. 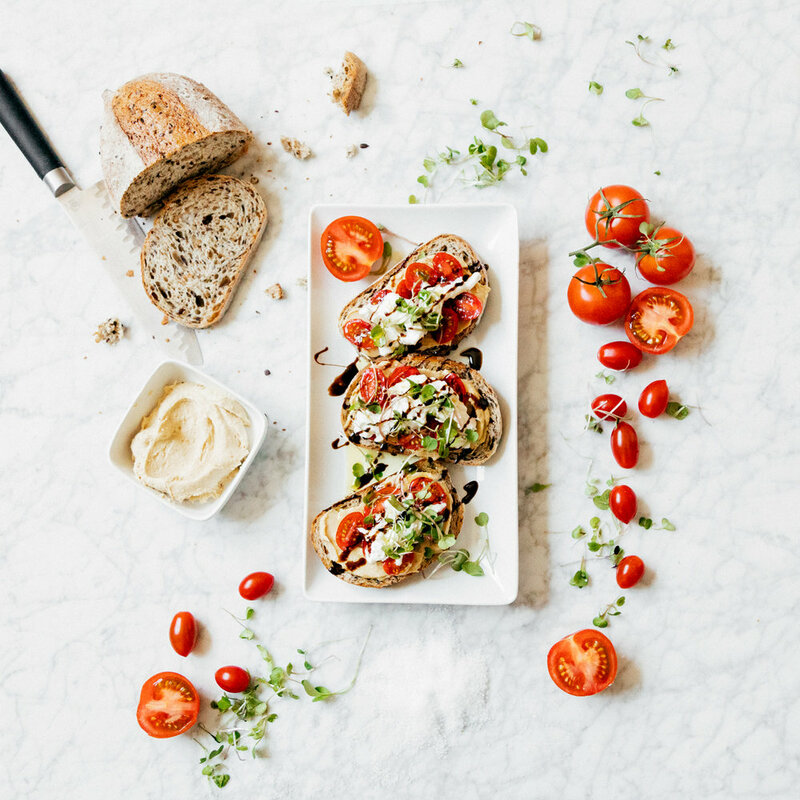 I quickly got in the kitchen and experimented with all sorts of concoctions - my Mediterranean themed toast was shockingly underwhelming for the record; going to have to take another stab at that one- but Jordi and I were in love with this Burrata & Tomato combo at first bite!! Full disclosure- anything with burrata is my friend. The close second that has been a new staple in my breakfast rotation: Sourdough + hummus + thinly sliced Honeycrisp apples + drizzle of honey + dash of cinnamon. Also #heaven. Can’t wait for you guys to try!! 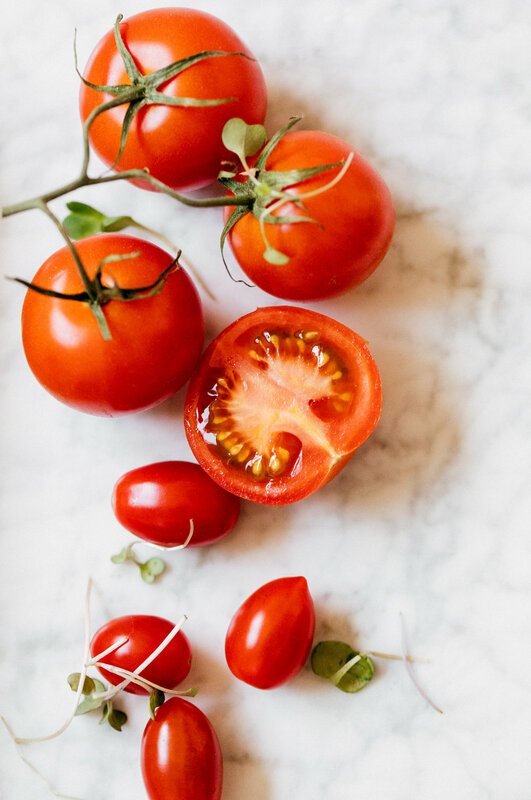 Toss sliced tomatoes in a drizzle of olive oil and sprinkle some kosher salt on them. Add them on top of hummus layer. Drizzle with balsamic glaze, a little more EVOO, and a sprinkle more salt.